: Jennifer Mulholland with the collaboration of R. Triquet. : In the Amiens Cathedral, the construction of which dates back to the XIII° century, one can see, carved in stone, two Lowchen which perfectly represent the breed. In the XV° century its distinctive silhouette was often depicted in tapestries. The breed was cherished by the ladies of the court of Burgundy. It was especially in the 17th century that the breed was represented in old masterpieces. Buffon describes it very precisely in his “Histoire Naturelle”, stressing its rarity. At the same period the Swedish naturalist, Linné also mentions it. The Lowchen was once called “Bichon Little Lion Dog”. 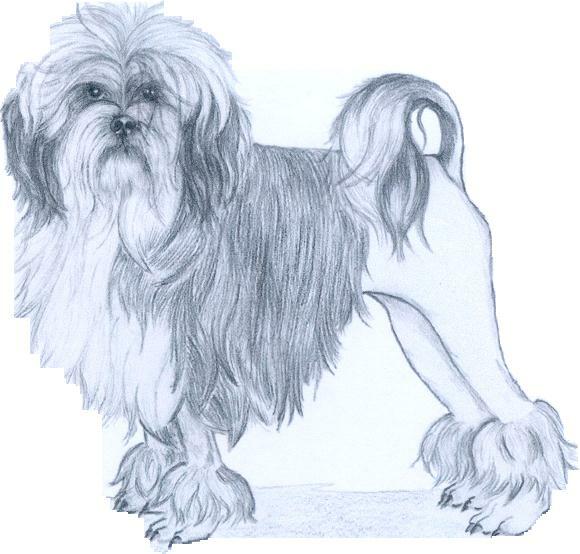 The French Breed Club was founded November 18th, 1947.
: A small intelligent dog, gay with a lively and alert expression; overall robust with good bone- short and well proportioned body- head carried high – pronounced tuck-up. The movement is proud and determined, accentuated by the floating mane from the lion clip; the unclipped areas should be completely natural and on no account should they be shaped. : The body is square. The length of the body (point of shoulder to point of buttock) is equal to the height at the withers. The length of the muzzle represents approximately 2/3 of the skull. : Very affectionate and obedient with its masters, attentive and receptive, at ease in all circumstances; capable of being calm and discreet on command. His forthright and tender look tries to understand what is expected of him. : Relatively short and quite broad from the top of the skull to the muzzle; carried high. : Relatively flat as broad as it is long. : Black (total pigmentation is obligatory), except for brown coats and derivatives. In the latter case, the nose is dark brown (total pigmentation obligatory). The nose is well in line with the topline of the muzzle. : Tight and black, except for brown coats and derivatives, in which case, the lips are dark brown. : Strong teeth, complete dentition with scissor bite. Absence of the PM1 is tolerated. : Set well forward, the eyes are large, very dark, round and well spaced; must be forward looking. The lids are totally pigmented. : Set low (level with eyes). Moderately long, capable of almost reaching, if pulled, half the length of the muzzle; pendant, well fringed. The fringes can reach, at least, to the end of the nose. : Of good length, slightly arched, merging smoothly into the shoulders and withers. : Well developed, down to elbow. : Set on slightly below the topline. Carried elegantly arched over the back without touching the latter. Only the plume touches the back either when standing or in action. : Well inclined, mobile, well muscled. : Short and straight viewed from front; slightly sloping viewed from the side. : Small and round, toes tight and well arched. : Well muscled, the tibia is the same length as the femur. The point of buttock is slightly prominent. : Relatively strong, the point is at approximately ¼ of the height at the withers, normal angulation. : Robust, perpendicular to the ground. : Lively, energetic and with good reach; legs parallel in action, head carried proudly. : The coat is silky, long, wavy, dense; without undercoat. : All colours and combinations of colours are permitted. : 26 to 32 cm at the withers, with a tolerance of +/- 1 cm. Eyes small, almond shaped, protruding, too light or wall. Ears not long enough or without fringe. Coat curly, too short, lack of waves.